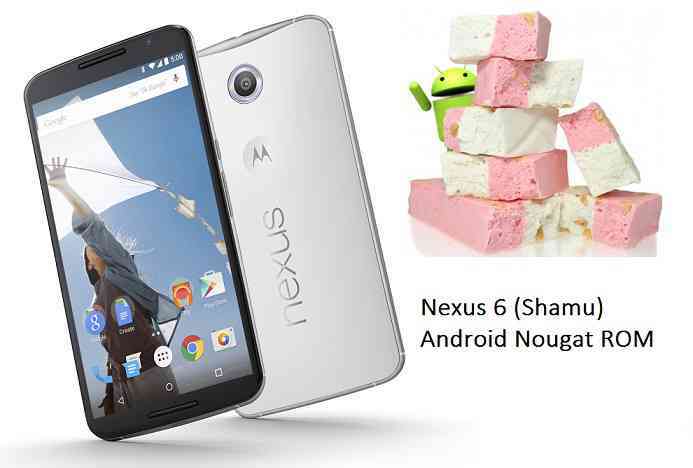 Android Nougat was released on August 22 and after the Android Nougat Source code release now the Nexus 6 Android Nougat AOSP ROM is available unofficially. These unofficial AOSP Nougat ROMs for the Nexus 6 (shamu) is brought to you by Zhaofeng Li, konradit, Miccia and nitin1438. Out of all three Nexus 6 AOSP Nougat ROMs, it seems like nitin1438’s build is pre-rooted. Download the Nexus 6 Nougat AOSP ROM zip file and a suitable Nougat Gapps zip file from the above download link and copy both the files to phone. First flash the Nexus 6 Nougat ROM ZIP from device. Wait for the flashing to be done and reboot the Nexus 6 and enjoy the Android Nougat. If you have any concerns regarding this guide or are you facing some problem then just login and leave a reply to get an instant response. Stay tuned or Subscribe to the Nexus 6 forum For other Android Nougat ROMs, CyanogenMod 14 ROMs, other ROMs and all other device specific topics. The development thread for Zhaofeng Li’s ROM is here and for konradit’s is here.